Have you heard? Spring has come early! In fact, winter never really even stopped by Kansas City. We had a few cold snaps, and really only one snow (I suspect the teachers and school-age kids feel ripped off in the snow days department this year! ), and the rest of the winter was mild, mild, mild. 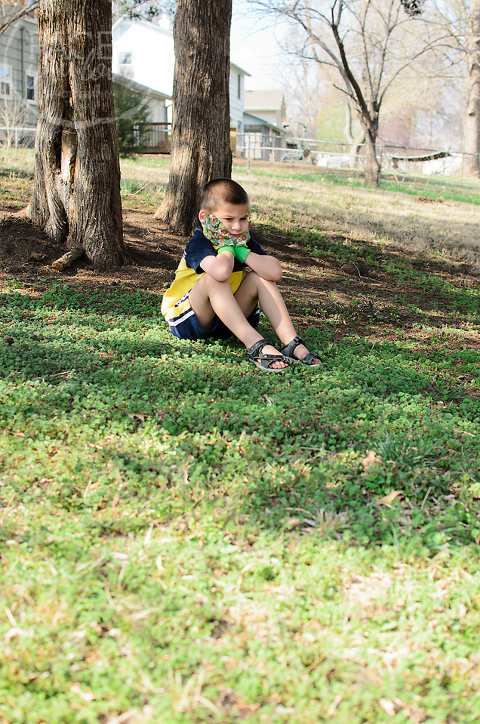 While an early spring and a pretty much nonexistent winter means more bugs this year (or so they’re saying), it also means the flowers are popping up weeks sooner than usual, flowering trees are doing their thing early, Nick will have to mow the lawn in March, annnnd…..
That’s right! We started the veggie garden! This was actually done a week and a half ago, and if you were to go take a peek in the garden now, you would see some spinach, lettuce, peas, beans and broccoli poking up through the soil! 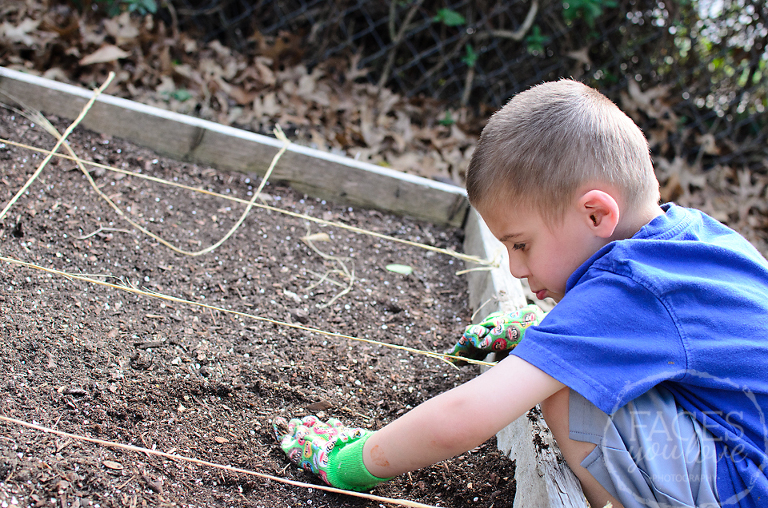 The boys were so excited to get the garden started! 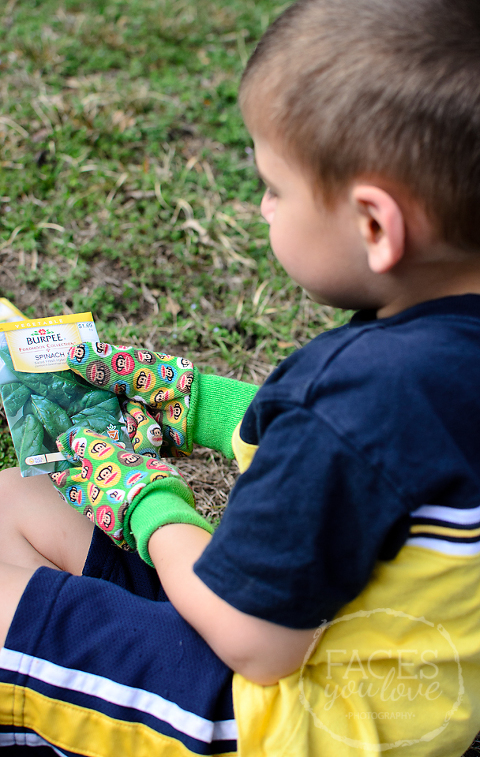 We even outfitted them with kid-sized gardening gloves this year, which they’ve loved wearing when helping Nick with other outdoor projects too. Then Jackson decided it was “too hot” to garden, so he went and sat in the shade. Did I mention this was all on March 14th? Poor Jackson is really in for a rough summer if he’s too hot in March! This is by far the earliest I’ve ever started my garden. Usually I don’t get to it until May sometime (and really most things could be started in mid-April usually), but this year I took advantage of the awesome weather and the sudden burst of motivation I had. Worst case scenario – we have a quick cold snap blow through and I cover the garden in plastic sheeting to protect the plants. If that doesn’t work, then I’m out a whopping $1’s worth of seeds and replant at what would be the more “normal” time. I’m pulling for no major frosts or freezes though and fresh veggies at our table weeks earlier than usual! With any luck, I’ll be able to start the more heat-loving plants early too, but we’ll see. Don’t forget to enter the giveaway from Lily Cole Designs! You can enter until Tuesday night, and the winner will be announced Wednesday! Enter HERE.